TWO LATE goals weren’t enough to help Donegal get their National Hurling League campaign off to a winning start on Sunday. Trailing by ten points at the break, Donegal needed goals to get back into contention, but they couldn’t find a way through the Roscommon rearguard until injury time at the end of the second half. Buncrana’s Steven Boyle burst through the middle in the 71st minute and fed Eugene Organ who in turn passed to Lee Henderson and the Mac Cumhaill’s sharpshooter found the net from just outside the parallelogram. That reduced the margin to five points, and that was further reduced to two point moments later when Burt’s Enda McDermott cracked the sliotar into the net from 25 yards out. Roscommon were hanging on for dear life as Donegal mounted one last attack in the third minute of injury time when Niall Campbell dropped a free in around the square. But Roscommon managed to clear the ball and were mightily relieved to hear the referee sound the full time whistle. 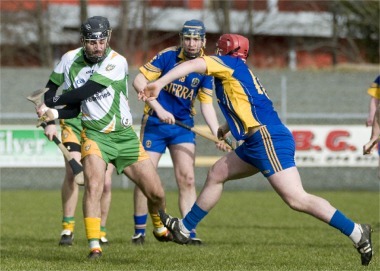 Wallace was critical of the impact that club hurling commitments had on his side who, for long periods of the game, were outplayed by the visitors. “Our players were dead on their feet today. Every one of them played an Ulster League match with their clubs last night [Saturday] whereas the Roscommon players came here fresh. “I don’t know what I can do about it but if we’re going to be serious about county hurling we’ll need to do something about this. Your club is your club, and players should be playing with their club. But when players play for the club on a Saturday evening the county is coming second. Wallace said he would discuss the matter with county board officials to try and avoid a repeat ahead of the county’s remaining league games. Donegal opened the scoring in the first minute when Niall Campbell cut a sideline short to Enda McDermott and pointed after taking a return pass. Gary Fallon responded with a free for the visitors and the high-scoring John Coyne opened his account with a point from play in the 7th minute. A clever diagonal free from Joe Boyle found the unmarked Enda McDermott and the latter hit the equaliser on 9 minutes, but it was all Roscommon after that. With a strong wind at their backs, Roscommon spent the remainder of the half firmly camped in the Donegal half with Gary Fallon unerringly accurate from frees – the Athleague man scored five points from the placed ball in the first half alone. Donegal goalkeeper Paul O’Brien came off his line to deal with a long, speculative ball and ran into corner back Barry Friel. The sliotar spun loose and Coyne was on hand to stick it to the empty net to give Roscommon a 1-6 to 0-2 lead. To make matters worse, Friel sustained an arm injury and had to be replaced by Mickey McCann. Roscommon added a further four points before half time, with Donegal managing only a single free from the stick of Niall Campbell and the home side trailed by 1-10 to 0-3 at the break. Campbell added three points early in the second half, but two from Gary Fallon and one from Gerry Fallon kept the scoreboard ticking over for the visitors. Lee Henderson and substitute Sean McVeigh got on the scoreboard for Donegal, and Campbell added another point, but the home side trailed by 1-14 to 0-9 as the game entered injury time. Those two late goals gave Donegal a boost, but it was much too late and Roscommon, who had lost their opening game against Mayo seven days earlier, held on for the win. Donegal’s next match is away to Monaghan in a fortnight.